Due date of Efiling of VAT-20 under Punjab VAT Act, 2005 for the year 2011-12 has been further extended to 11th January 2013. 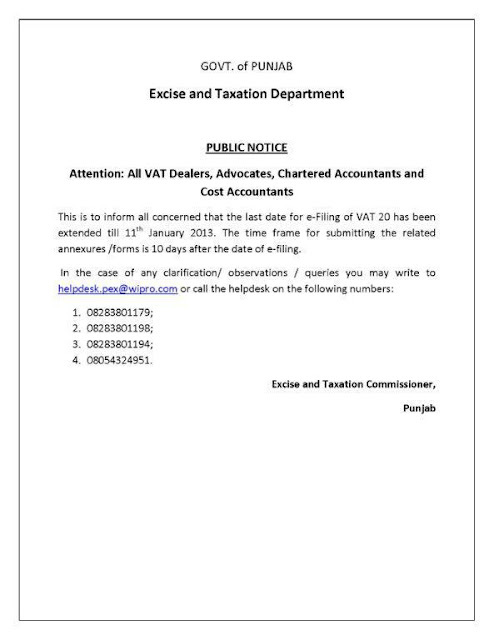 The efiling receipt along with requisite annexures are required to be filed with the Departmnent within 10 days from the date of efiling. CBEC has issued a circular regarding recovery of confirmed demand during pendency of stay application. It has been directed in the circular that recovery proceedings are to be initiated within 30 days after the filing of an appeal if no stay is granted. It is well known that hearing of cases before the appellate authorities dont come within 30 days from the date of filing of an appeal as the number of appeals is huge. Thus stay application moved may also not be heard within 30 days. In such cases if recovery proceedings are initiated then it will amount to hardship to the appellent and is also against the basic rule of law audi alteram partem i.e No one should be condemned unheard.